Located on the Fort Totten Indian Reservation, this North Dakota State Historic Site got its start in 1867 when soldiers built a log structure that in no time was enlarged and expanded to include dozens of buildings. Situated on the southeastern shore of Devil’s Lake, its purpose was to protect the Totten Trail, an overland route which extended across Dakota Territory from southern Minnesota to the goldfields of western Montana, and later, to control and protect the Totten Indian Reservation. Fort Totten was just one of a number of posts built to protect the overland route – others included Forts Abercrombie, Ransom, Stevenson, and Buford, as well as Fort Benton in Montana. Early in the summer of 1867, with a considerable force, General A. H. Terry advanced into Devils Lake Region, where work began on the fort, which was named for Brevet Major General Joseph Gilbert Totten, late Chief Engineer of the United States Army. The following year, the soldiers began to rebuild and enlarge the fort. When the fort was first established, there were no Indians in the immediate vicinity. However, the following winter, the fort invited the Sioux for a visit. After the Indians determined that the invitation was made in good faith, many of them began to gradually come to the fort, some settling permanently. This was probably due to their starving condition, as the fort’s commander found it necessary to issue large quantities of rations to these Indians during the first winter to prevent their dying of hunger. In 1870, J. W. Daniels, the Indian Agent on the Sisseton Indian Agency, Dakota Territory, recommended that an Indian Agent be appointed for the natives living around Fort Totten. The old log quarters were then allocated for the use of the Indian Department and the first Indian Agent arrived in May 1871. In September of that same year, the Indians were estimated to have numbered more than 700, surviving not only on government rations, but also had planted over 100 acres in corn, potatoes, turnips, wheat, oats, and hay. Though the Fort Totten Indian Reservation had been provided for in a February 1867 treaty and 360 square miles set aside by an Executive Order in January 1870, the reservation wasn’t formally established until 1878. 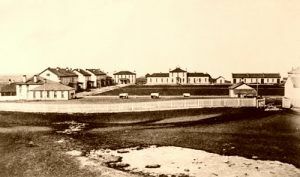 In the meantime, the fort continued to expand in the1870’s, including a sawmill, a granary, officers’ quarters, barracks, a hospital, bakery, commissary, a school, and more; most of the structures built of brick. A Catholic School was to be established at the Indian Agency and by 1875; the agency had grown to five buildings. Finally, in 1878, the surrounding reservation was formally established for the Cut Head, Wahpeton, and Sisseton Sioux in 1878 in accordance with an 1867 treaty. Though the fort continued to serve as a military post, its functions were primarily spent on Indian affairs over the next decade. In 1890, Fort Totten was decommissioned and the next year, it became the property of the Bureau of Indian Affairs. For more the next half century, the buildings were then used as an Indian boarding school, health care facility, and a reservation school, which continued to operate until 1959. The next year, the Bureau of Indian Affairs transferred the bulk of the fort site to the State of North Dakota for historical purposes. The site then became the Fort Totten State Historic Park, which was listed on the National Register of Historic Places in 1971. Fort Totten today, courtesy Fort Totten State Historic Site. Today, Fort Totten is one of the best preserved military posts of the frontier era with 16 of its original buildings still standing, including officers’ quarters, barracks, family units, the commissary, bakery and more. A museum is located in the historic hospital building. Fort Totten is located in Benson County, on the Fort Totten Indian Reservation, just southwest of the town of Fort Totten, North Dakota. Hi Tom, sorry, it appears we do not have one.